Her name is Maizy Evans, she’s from the stunning Southern Highlands of New South Wales, and we’ve got the feeling you’ll be hearing a whole lot more about her as the years roll by. Maizy started cycling at just 5 years of age and before too long was competing in minor races in the under 6 category. She progressed to national-level racing while still aged in single figures, and competed in her maiden National Championship at age 11. Now, at 14 years old, Maizy is a multiple national age champion. An incredible effort isn’t it … So we tracked down the super-polite young Maizy and started by asking her to list her mind-blowing achievements. “I am very proud of what I have achieved in the past years,” she told us. “The year of 2016/17 was one of my major training years as I was going for my first national title in the U15 category. “I competed in the national series and collected a Gold and 7 Silver medals. 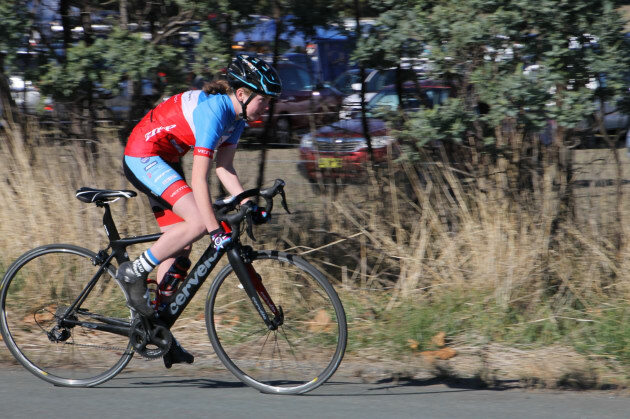 “Heading in to the National Championship in Canungra, Queensland I was unbelievably shocked to collect not one but two national titles in the XCC and XCO discipline of the U15 category. “Following that, this year I again competed in the National Championship which was held in Armidale NSW. I blew away the field in the XCE, not only taking the title in the U15 category but making it to the elite final where i claimed the fourth overall spot. Being the youngest rider I was super happy. The next day I competed in the 2018 XCO discipline and rode a tough battle to finish second overall. Bicycling Australia: Wow .. that’s super impressive and we feel like we’ve ridden 100km just reading all that! So what are you training for and targeting now? Maizy: As I am now 14 years old I have finished up in the U15 category and am heading in to a tough battle in the U17 category. Later this year I will start training for the 2019 National Cup which starts in December. That will lead to training for the next National Championship where I hope to claim my first U17 title. “I am confident that I will place in the U17 category, but being a first-year rider it will definitely push me out of my comfort zone. Bicycling Australia: We’ve heard about your family supporting your road and mountain biking, and even your mum training with you? Maizy: Yes, I am so grateful for everything my family does for me, from the financial backing to the hours they spend on the bike with me. My sister Verity, who went from a little U15 rider who competed in the occasional race to holding the Junior Women XCM National title, she works so hard not only for herself but she pushes me to train and race harder. “My Mum is also a major motivator, she is always the one to wake me up at 5am and get me out on the bike. She’s the one in the feed station handing me bottles and the embarrassing one at the finish line taking photos! “Not only does my mum support my racing but she also races herself in the Masters 5 category where she holds the XCM National Title. “She is currently in Europe racing at the XCO Masters World Championship representing Australia for the second time. I am encouraged not only by my family but also my friends and team mates around me – they are the ones that get me through all the tough races. Without them I don’t think I would be wearing the Green and Gold. Bicycling Australia: What are you riding and are you supported or sponsored ? Maizy: My Mountain Bike is a Team Edition Focus Raven Max and my road bike a Cervelo S3, both of these bikes were supplied by The Fixed Wheel Bowral, and my Mountain Bike is provided through Focus Bikes Australia. Bicycling Australia: You mentioned the Fixed Wheel, an awesome boutique bike shop in Bowral. Maizy: The Fixed Wheel have not only offered me a position in their race team but also all the equipment, funds, clothing and bike checks I need for peak performance. The Fixed Wheel Race Team consists of 13 locals including my sister and my mum. I train weekly with them – they are very supportive. Bicycling Australia: And Bowral – the home of the Bowral Classic – tell us about cycling the Southern Highlands? Maizy: Bowral is the location of some really beautiful country roads where I enjoy most of my time on the road bike and the Bowral Classic is always a huge feature on my calendar! Last year I did the 45km ride and it was great fun! Not only the scenic local roads and stunning views, but meeting the new people and riders along the way. The Bowral Classic is a great opportunity to enjoy what you do on the bike with people who can enjoy it with you. The environment is great , from the volunteers at the early morning start to the many food stalls and their well deserved after ride snacks. It’s also great for women’s cycling to branch out and open up to females who may not be active enough. I cant wait to hit the start line of the 90km event this October. Bicycling Australia: Your major goals – what can we expect in the future? Maizy: My major long term goal is to represent Australia in mountain biking (XCO) in the Olympics. Whilst collecting my national titles I will always be working towards being the best I can and hopefully being enough to be selected to compete. My life goal is to help inspire young kids to get active. I love to ride and race and love seeing younger kids out and enjoying the dirt themselves. As I train for my races I also want to help younger kids achieve their goals. As I mentioned, my sister is a talented cyclist and my true inspiration. It fascinates me how she never gives up and makes time for cycling no matter what. I am super happy to train with her and see her fly past in races. Verity has passion and drive, she is going to make big things happen. Bicycling Australia: Your advice for younger riders and any final comments? Maizy: I started with a pink bike, training wheels and a pair of sneakers. I’ve now got 4 National Titles, a fresh pair of Shimano shoes and a whole bunch of people who support me. I learnt that with a passion, dreams can come true. Enjoy yourself and believe you can achieve the unachievable.